Did you just visit the doctor to check something about your heart? Get more information on the heart and your conditions here! The heart is one of the most important organs in your body. It controls all of the pumping of blood in your body. Check out this video to learn more about how it does this! An ASD, or Atrial Septal Defect, can sound really confusing but it’s actually pretty simple. Afi and Zozo will tell you all about it in this short video! A VSD, or Ventricular Septal Defect, can sound really confusing but it’s actually pretty simple. Afi and Zozo will tell you all about it in this short video! There are many ways to fix different heart defects. Using a catheter is one of them! Check out this video to see exactly what to expect when undergoing a cardiac catheter procedure! Wondering what a PDA is? Afi and Zozo will tell you all about it in this short video! Usually your heart will sound like it’s going “ba bump, ba bump”. Sometimes, though, there can be irregularity in the way the heart beats. 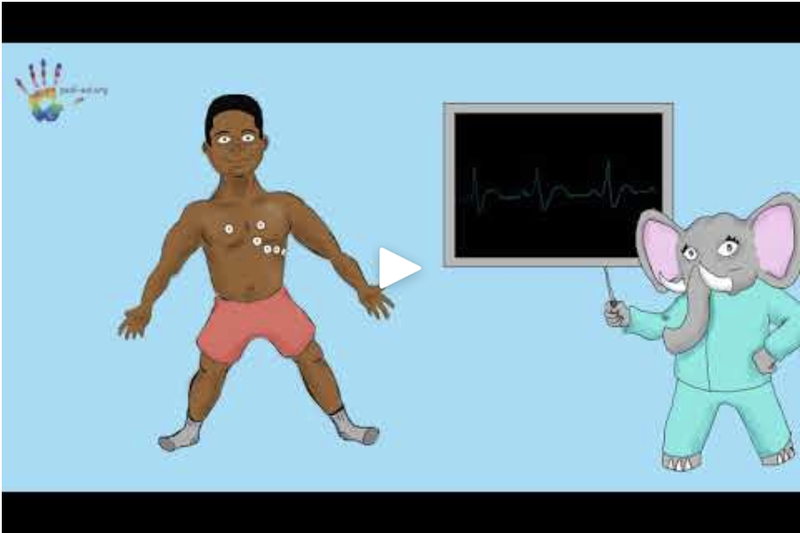 This is called an arrhythmia, learn more in this video! In order to take a close look at your heart, the doctor may use an echocardiogram. Afi and Zozo will give you a heads up on what to expect if you’re going to get an echocardiogram!